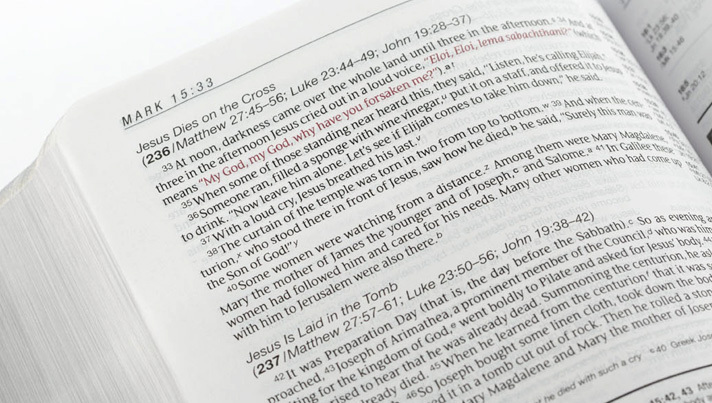 The NIV has won praise for its clear design as well as its translation philosophy. James Joyce, Joyce Carol Oates, Gertrude Stein, Elie Wiesel, the New International Version of the Bible: What could these names possibly have in common? Ernst Reichl was one of the top designers in the American publishing industry when Zondervan Publishers turned to him for help with the layout of the NIV. The worldwide publisher, the New York Bible Society (now Biblica) and the Committee on Bible Translation (CBT) had invested untold hours and resources in the translation process, and no one wanted poor design to hinder readability or understanding. The CBT had already established editorial styles that arranged psalms as lines of poetry to a greater degree than had previously been seen in Bibles. It had laid out family lineages as lists and inserted subject headings for chapters. Reichl’s decades of experience and critical eye would help the CBT to finish polishing the design for maximum clarity. Analyzing previous versions of the Bible and the NIV manuscript, Reichl worked with the CBT to create wide margins and put verse numbers in small superscript within paragraphs to make the text as readable as possible. Reichl also devised a footnote system that included letters that directed readers to footnotes, and verse numbers in the footnotes that directed them back to Scripture. Zondervan was on board to make the Bible as uncluttered as possible. People live with their Bibles for years, flipping through worn pages and memorizing passages. A pleasing page layout could only benefit the translation by making the text even easier to read. When the modern typeface that was chosen, Zapf’s Palatino, didn’t reproduce cleanly in proofs of the NIV, Zondervan agreed to finance an electronic conversion of the typeface to make it clearer. “It is a modern typeface, quite wide, incorporating hundreds of years of tradition,” Reichl said. The results added beauty and clarity to the text. In 1974, the NIV New Testament was shown in an exhibition by American Institute of Graphic Arts. The CBT has continued to adjust the layout of the NIV to make the text consistent and as easy as possible to understand. At a recent meeting, the committee decided to insert half-line spaces between certain verses in Genesis 1 to convey the structure of the passage and visually separate the days of creation for the reader. As more people read the NIV on electronic devices, the CBT has also had to consider how formatting intended for a printed page translates to a narrow smartphone screen. As a result, paragraph indentations are now smaller so that the text flows more smoothly and more verses can fit on a small screen. Sometimes, reformatting the NIV can provide a fresh understanding of Scripture. First published by Biblica in 2007, The Books of the Bible arranges individual books into thematic or chronological groupings. 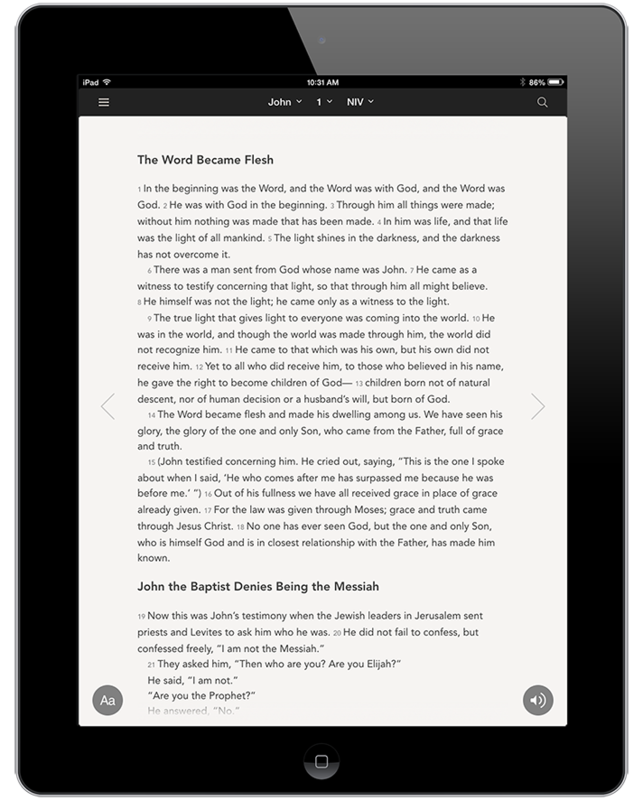 It removes verse or chapter numbers to facilitate a more natural reading experience. This “new” format helps readers encounter each book in the way its authors intended. Today, people can purchase numerous devotional study and audience-specific Bibles in the translation, such as the children’s NIV Adventure Bible, the NIV Teen Study Bible, NIV Real-Life Devotional Bible for Women and most recently the NIV Zondervan Study Bible, a flagship Bible for the translation. Regardless of format, however, every version of the NIV serves a greater need: making the Word of God accessible to people worldwide in language they can read, understand, and trust.